To compliment our selection of wines, hors d' oeuvres will be served. Fifty dollars of the $75 fee is put towards your first wine purchase. Phone reservations only- this is a ticketed event. The sandy soil of north Piemonte is home to the appellation Roero and the indigenous variety, Arneis. Stefano Almondo is a master of the rare variety, crafting aromatic and mineral wines that rival any of the best white wines in Italy. The 2018 Vigne Sparse dazzles right out of the bottle; floral and fruity yet with a chalky mineral streak, the wine is wildly complex. The mid-palate has layers of concentrated citrus fruit and the finish is stony and a minute long. Pair this wine as you would with a steely white burgundy, with roasted chicken, delicate fish dishes, veal scallopine and best of all, clam pizza! Winemaker and proprietor, Dominique Roger, whose family has been making Sancerre in the village of Bué since the 17th century, produces vibrant, sharply focused wines from limestone-rich soils. His white wines have been staples at the Restaurant since the day we opened the shop. The 2017 Sancerre is uncommonly fine, with a brilliant, pale green color and soaring aromatics of green apples, pear and jasmine. Domaine des Terres de Chatenay is a nine hectare estate nestled in the limestone-hillsides of southern Burgundy. In the village of Péronne, Jean-Claude Janin and his wife Marie-Odile craft honed, laser-like renditions of Chardonnay, with soaring aromatics and mineral-flecked concentration; characteristics generally reserved for wines twice this price. The 2017 Mâcon-Péronne is old vine Chardonnay, done in steel to preserve the inherent fruitiness and pure aromatics of the best of white Burgundy always has. It’s a great choice for a house white, perfect with so things, roasted chicken, flaky white fish and just by itself as the perfect apertif. Adam Tolmach of Ojai is one of the pioneers of Santa Barbara County. He founded Au Bon Climat with Jim Clendenen, then moved on to start Ojai in 1983. He’s never grown past the 6000 cases he makes today, in 3 rustic temperature controlled barns in the backwoods of Ojai. He now only works with cool climate vineyards, pays the growers by the acre, ensuring his own control of the farming and yields. His latest release of Bien Nacido Chardonnay is aromatically complex with a concentration of fruit and mineral backbone generally reserved for wine twice its price point. The 2017 has pure, concentrated fruit, just a touch of oak and then laser-like acidity add up to a wine that works superbly with food but is delicious just on its own too. The estate of Emrich-Schonleber is small, encompassing only 14 hectare in the region of Nahe. These naturally tended vines are on steep slopes; its soil comprised of Devon slate, facing south and southwest. All fruit at Emrich-Schonleber is allowed long hang time to fully develop the brilliant minerality and intense fruitiness of these classically styled Nahe wines. The 2017 Lenz features ripe fruit, with just a touch of sweetness, balanced by crisp acidity. Pair with Easter ham, Asian cuisine, sausages on the grill, turkey or grilled fish. Gassier is a Provençal, organic estate in the shadow of Mount Saint Victoire. It’s a refined, elegant rosé with aromas of strawberry and red flowers. It’s got great fruit and finishes fine and long...perfect with just about any kind of food you can dream up. 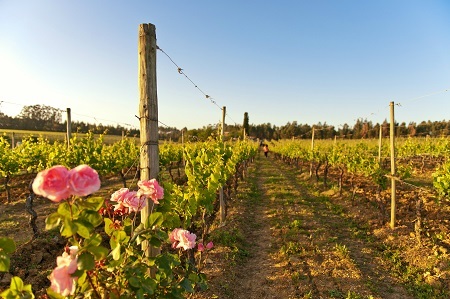 That’s what is special about Provençal rosé, it’s the most food friendly wine going. Melissa and I discovered that on our very first trip to France so many years ago. If you haven’t already, you need to discover it as well! Domaine Barmes-Buecher is a family run domaine from southern Alsace, striving to create the most expressive and powerful wines as Mother Nature will allow. Domaine Barmes-Buecher is completely biodynamic, an ancient and organic way of farming using no chemicals. This process, although incredibly time-consuming and expensive, allows the vines of Domaine Barmes-Buecher to be healthier and to produce riper, more balanced fruit than any of their neighbors. Their rare Pinot Noir is ripe and round but balanced by a firm structure and mineral finish. Pair with salmon, grilled lamb or Alpine cow cheeses. The red wines of Chinon and of Loire Valley reds in general are the quintessential Tuesday nighters, delicious with anything. One of my favorites is Fabrice Gasnier. He’s a bundle of energy, as excited to talk about the pile of organic compost brewing behind his shed as he is to discuss his brilliant wines. His base wine, the Chinon Les Graves, is 100% Cabernet Franc, a medium bodied, fresh red wine as good with beef stew or pizza as it as with a dish of roasted salmon. When Melissa and I go out to dinner, we often choose a bottle of Chinon on the list....it always way over delivers for the money and it is just delicious at any table. Set on rolling hillsides along the right bank of the river Gironde, just north of St Emilion, the old vines of the tiny Chateau Monteberiot are rooted in a mix of limestone and clay soils. It’s perfect terroir for producing juicy Merlot, Cabernet Sauvignon and Malbec grapes. The 2015 is a classic Right Bank Bordeaux, with a nose of red and black berries with just a touch of sweet tobacco and earth. The fruit on the palate is dark red and multi-layered, with a silky finish, long and stony. It’s an incredible buy at $20, wine that will be delicious at your table this year...and maybe better over the next 5-7 years. Dedicated to bringing historical California vineyards and varietals to the forefront of winemaking, Three specializes in handcrafted vintages of Zinfandel, Petite Sirah and Rhone blends. Winemaker Matt Cline yields to his California heritage, pulling from multiple varietals and appellations in his quest for the perfect wine. The 2017 Zin has a deep purple color with aromas of dark red fruit and white pepper. The wine is ripe, bursting with fruit and spice, the absolute perfect foil to a juicy burger. The Jaume estate encompasses 50 hectares of selected vineyard land in and around the hamlet of Vinsobres, in the southern Rhone Valley. The vines have been tended naturally for 50 years. Natural farming and immaculate, careful winemaking ensure the Jaume style: aromatic and racy with powerful, pure fruit.